Welcome to our guide to 59 types of chairs for your interior design including a variety of design styles. There tons of different types of chairs and even more ways to use those chairs for practically any design. Many of the chairs can be used in different locations and mixed and matched depending on the room. Here are 50 types of chairs to get you started! One of the places you can be designing for is a home. The chairs chosen to be placed in a home versus and office will have some differences, but some will even overlap! 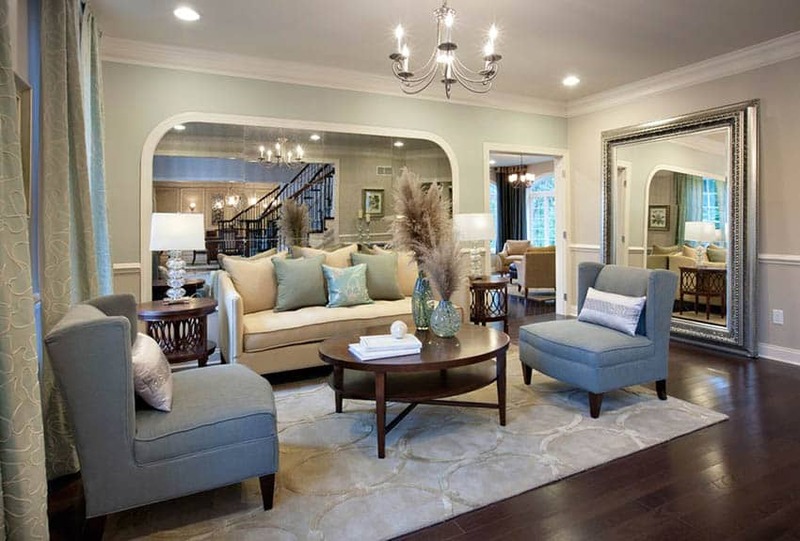 Plus, each room in the house could have different types and decor needs that will work best in each specific setting. Whether the need for seating is in the kitchen, bedroom, or living room, there are many options to choose from. Here are some of the most popular chairs for interior design. 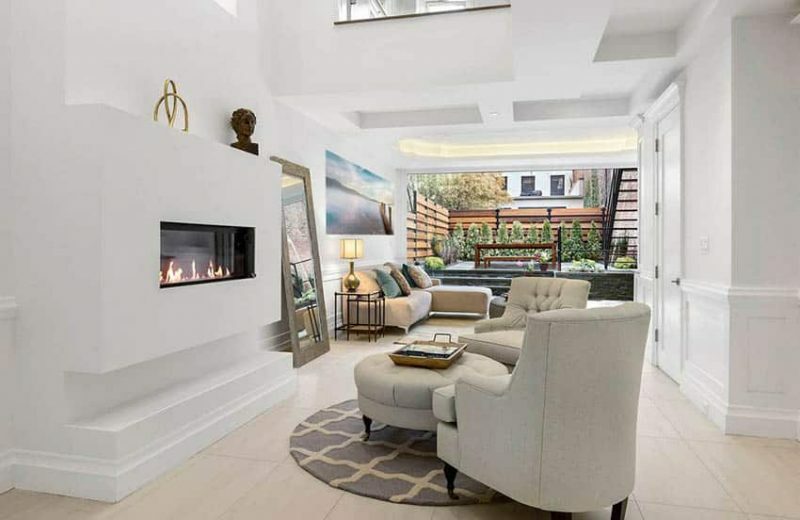 The living room is one of the most used rooms in the home, it is often where families gather for entertainment purposes or spending time with one another. It is also a great locations to entertain guests which can potentially require additional seating. Below are some ideas of chairs that would work best in the living room. 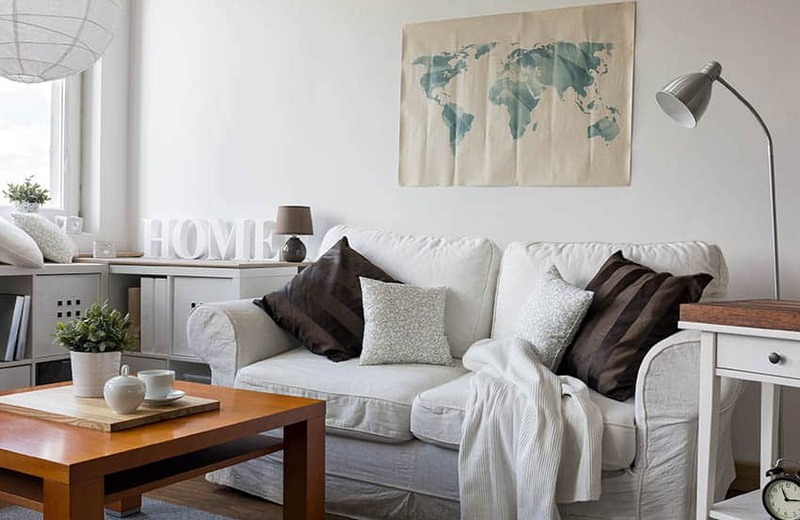 Armchairs are one of the most common pieces used within any space. They are an extremely versatile piece and are especially coveted due to the armrests. The armrest make the chair great for lounging and living. To be considered an armchair the only real quality a chair need to possess is that it has arms, which means a good portion of chairs will fall under this category. Armless chairs are basically the same as armchairs except for the fact that they lack armrests. This will make the chair less expensive, lighter, and more versatile. Without arms this chair can fit under pretty much any table or counter and it is easy to sit any way you like on it. 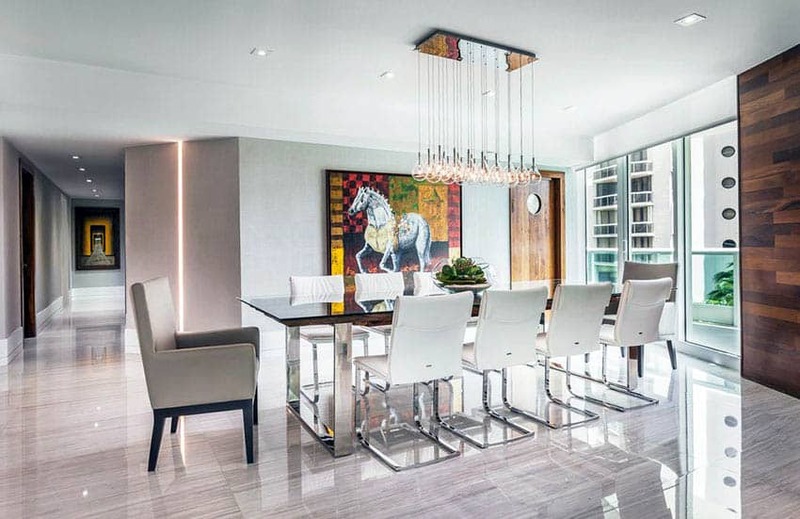 Often in dining rooms with oval tables the end chairs will have arms while the ones on the side will be armless to allow for more people to fit around the table. Armless chairs are frequently referred to as slipper chairs which we cover in more detail under accent chairs below. 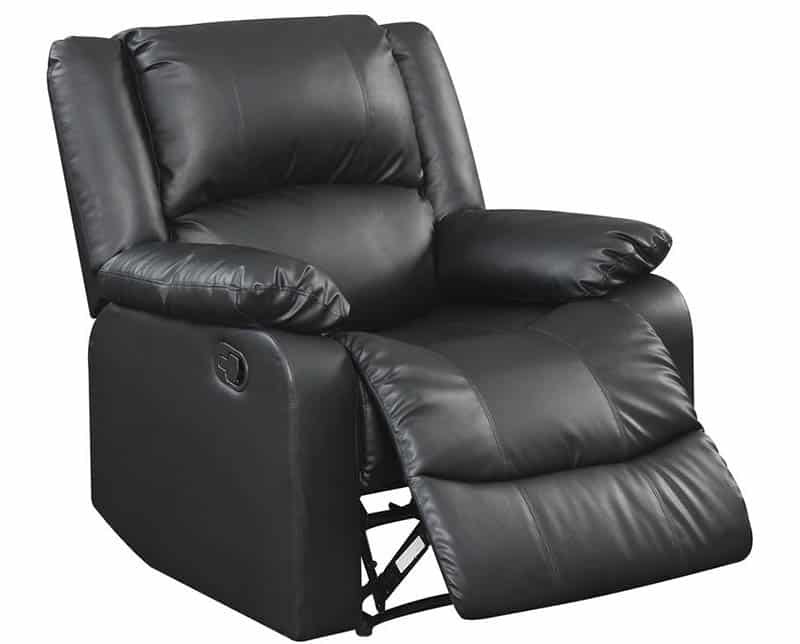 A recliner is chair that allows for adjustable seating levels. This is done by having a built in footrest. These footrests are usually accessible by a lever, button, or by leaning back in the chair. Recliners are fabric or leather and can range in style from traditional to modern. This is typically placed in a living room or entertainment room for ease of watching a television or activities such as reading books, magazines or newspapers. A loveseat is a piece that is bigger than a chair and a half and smaller than a true sofa. This allows for two individuals to sit in the chair, but maybe be a little close together if they are strangers. The idea behind the names suggesting that it was meant to get people to sit closer together. In the past this chair was created in the shape of an S where one person sat on either side so that the two were able to see and speak with one another. The slipper chair was designed to, as the name suggests, create ease when putting on slippers and other footwear. 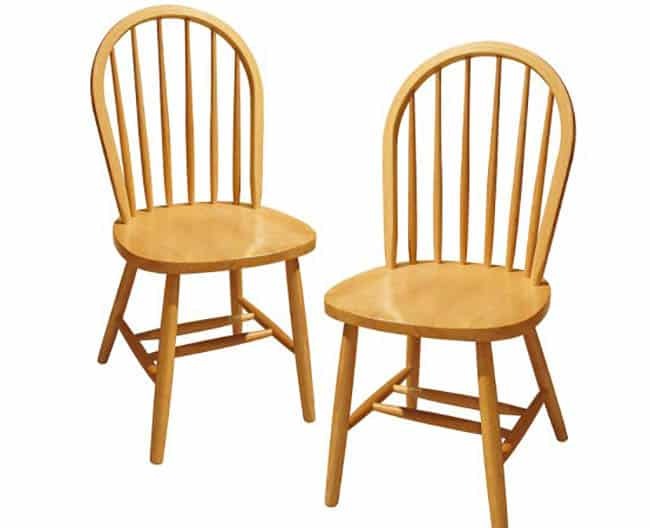 Slipper chairs come without arms, since the user will not be sitting long and will usually be bending to put on previously mentioned footwear. This allows them to move freely as well as sit at any angle. To help the functionality of the slipper chair the seat is closer to the ground, allowing the user easier access to their feet. This item can also be used around a coffee table for typical seating, but is recommended for petite and shorter people due to the lowness to the ground, making it somewhat uncomfortable for taller individuals. 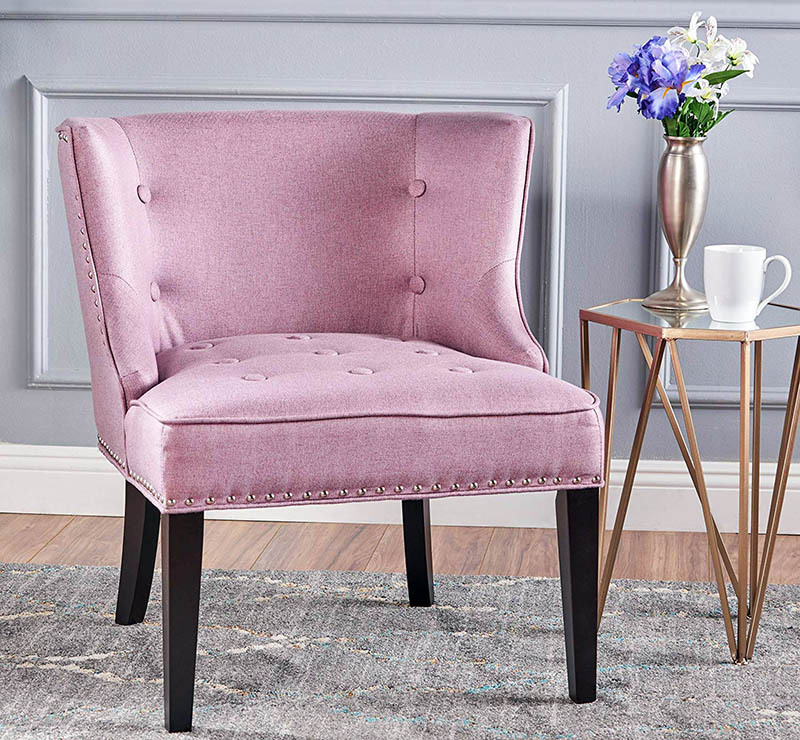 A side chair has a small solid frame that is not upholstered. It can have arms and/or an upholstered seat but neither of those qualities are required. These chairs are typically used in dining rooms or lounges and can be added to living rooms as extra seating. They are not very bulky for ease in mobility and storage making them perfect to bring out when entertaining. The wingback chair is a classic design that has withstood the tests of time to the ultimate degree. The chairs were originally designed to be placed in front of a fireplace where the “wings” (side of the chair) were large enough to keep the warmth no the person sitting in the chair, and to block the draft from them. This was important when there was not heating in homes and the fireplace was the full source of warmth. When wingback chairs were first introduced there were two styles, scroll and flat, now expanding to each style and era having their own type. The scroll type chairs had more ornamentation to them as well as rounder shapes. Flat wingback chairs were less detailed and had straighter lines. The occasional chair is one that will be used, as the name suggests, occasionally. This is often classified as an accent piece or a guest chair. 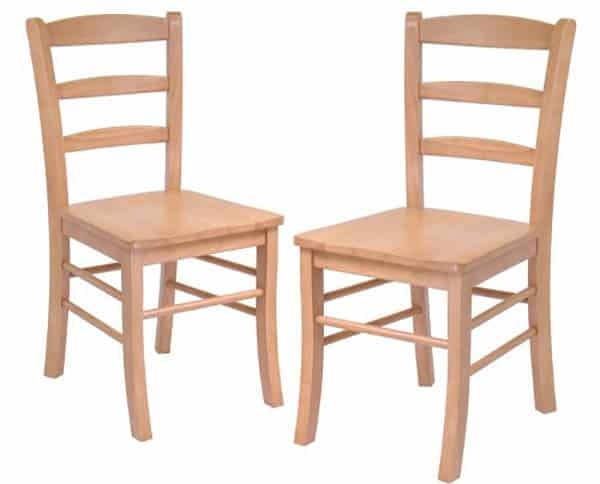 These tend to be and extra chair in the home and can be used for many different purposes. An occasional chair can be any number of types of chairs, for example, a wingback chair could be considered and occasional chair. Occasional chairs can either be used all the time or can even be something that is put away easily when guests are not there. 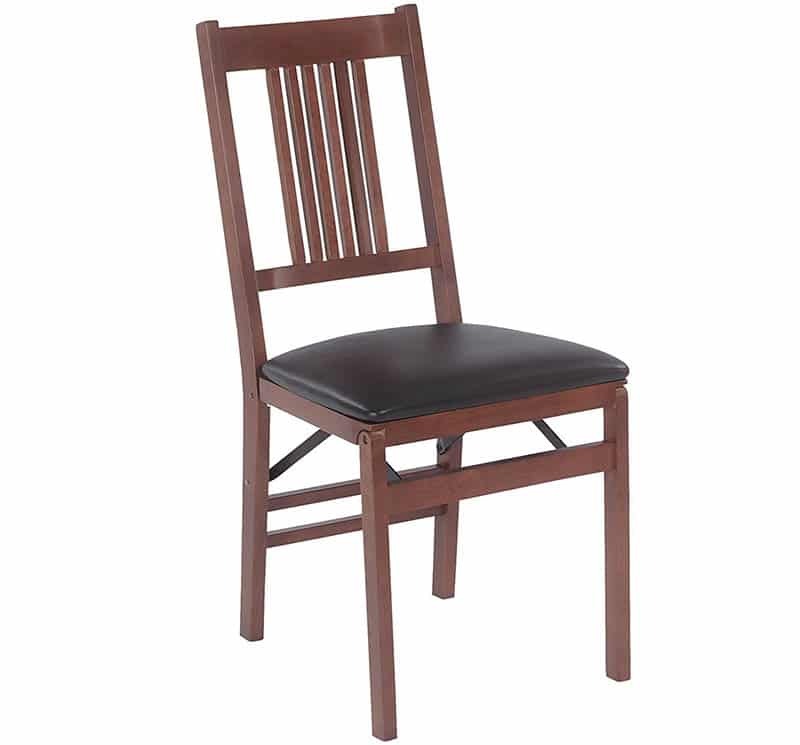 Clubs chairs are known for having backs that are low enough to flow into the armrests. These were typically used in gentleman’s clubs (hence the name), having the lower back allowed the seating to not separate the room and make conversation easier. Nowadays variations of the club chair are amazing accent pieces for many settings. The club chair is usually made with leather to show class and power but in homes will be made with a variety of different sorts of fabrics. The key features of the barrel chair are the rounded back, its size, and the height of the back flowing into arms. The chair is shaped almost like it is a barrel with a piece cut out, which is where it get its name. This creates a flow of the back of the chair into the arms, all being one height and connected which creates comfort when conversation is flowing all around. This type of chair is typically pretty large for added comfort. Another classic chair, this one designed by Charles Eames, has been an icon and staple in the chair industry. 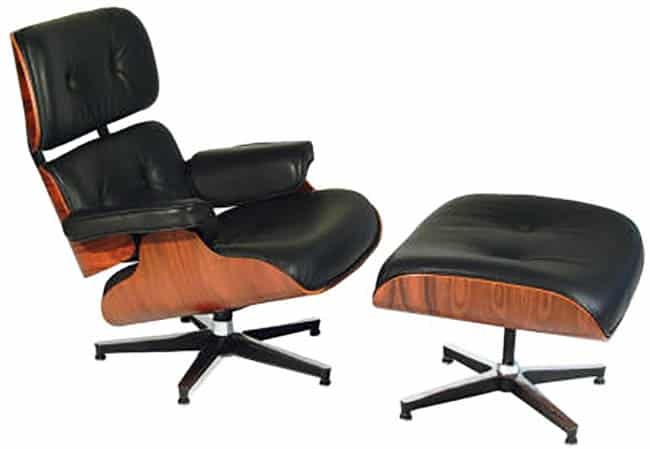 The Eames chair includes curves and leather cushions that uses comfort and style to make it a high demand product. The structure has been brought up to date with a plywood structure. These can mix and match fabrics to coordinate with the space. 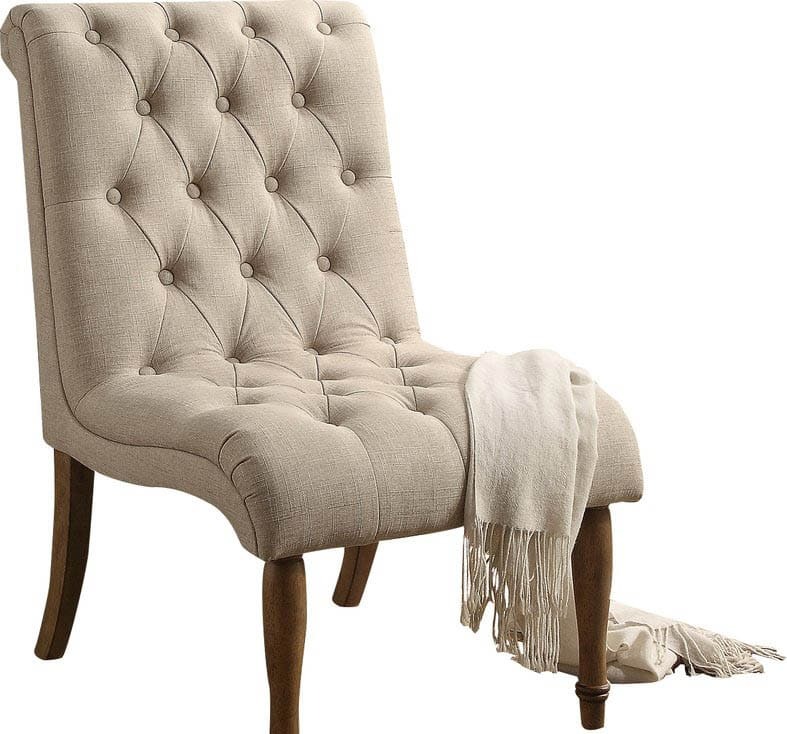 The English rolled arm chair has extremely low arms as well as a very deep seat. This gives the effect that you are sinking into the chair. To pair with this the seat cushion is extremely soft and plush which creates an extremely comfortable seat. As for the name of the chair, though the arms are low, that is not the only exciting part of them. The arms of the English Rolled armchair have a slight roll out to them which expands the space in the chair for added comfort. 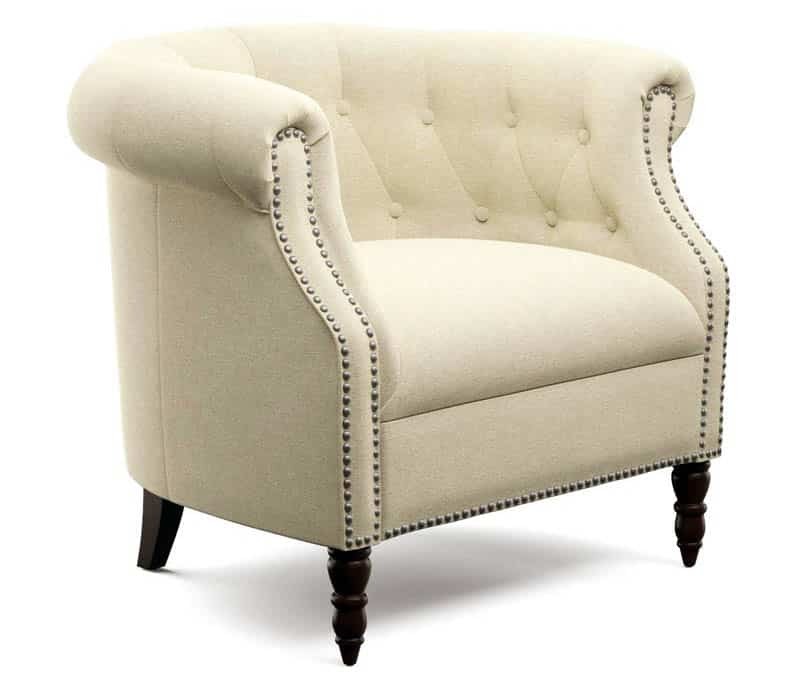 The Chesterfield chair is known for the buttoning and tufting that is part of their design. Tufting is created by passing threads through areas of fabric to create depressions adding a decorative look. Often buttons are placed in the middle to bring the look together and keep it looking clean. 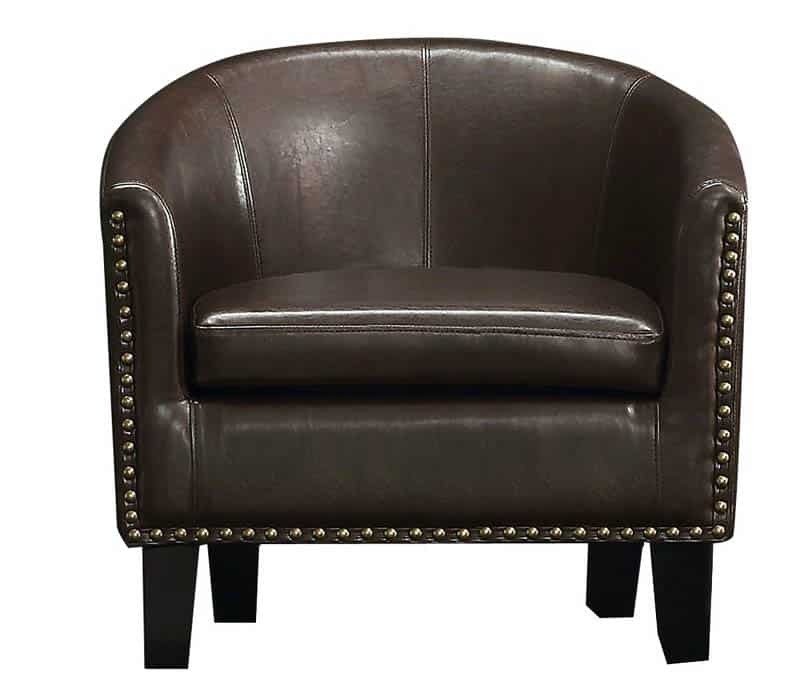 Typically, Chesterfield chairs will be made of leather, while some do still get upholstered. 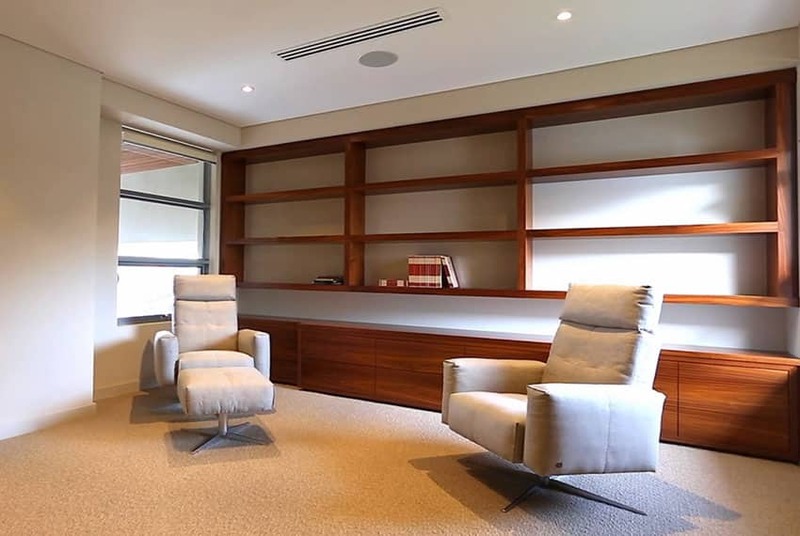 These chairs look comparably to the club chairs and wing chairs, so will typically be used in the same scenarios. The Lawson chair is most commonly known by its firm cushioning. 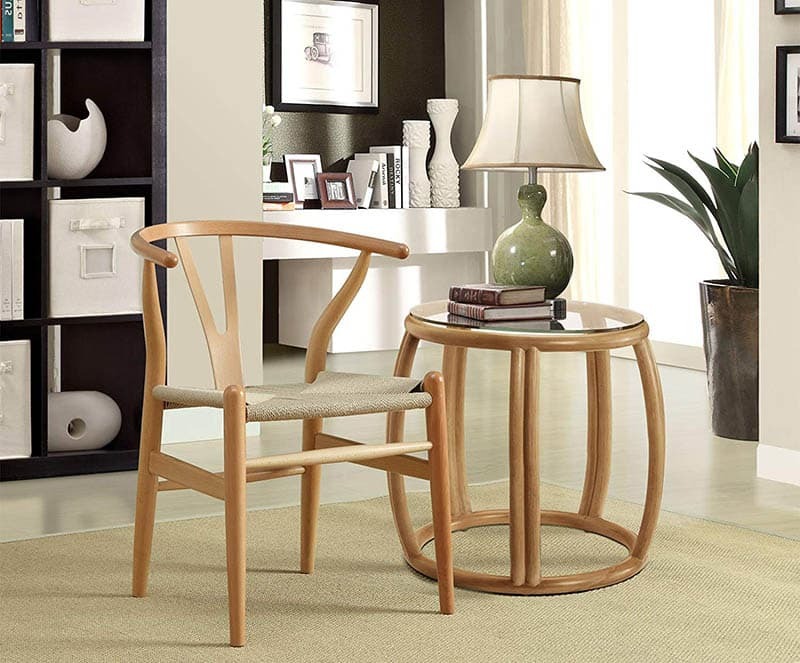 A Lawson chair can have square or rounded arms that are lower than the back, in direct contrast to the club chair. This chairs can be used in a number of settings, especially living areas and studies. Though it is an average chair it can be spiced up with eccentric colors and patterns. 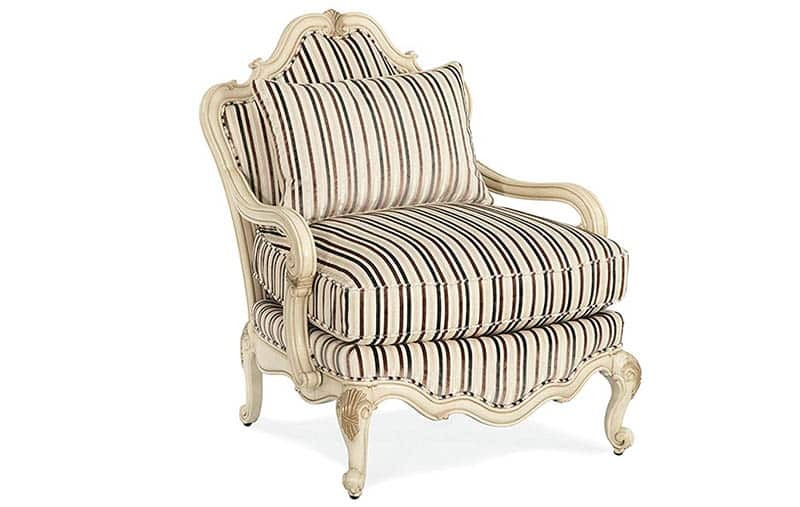 The Bergere is a chair with a wooden frame that is exposed around the upholstered back of the chair. It is considered to be part of the French Rococo style and drips with elegance. Due to the exposed frame and the ornamentation that is usually implemented it tends to seem like a regal decor piece. To avoid making the piece too fancy the seat has a looser cushion, but it still brings sophistication to a room it is placed in. Based on the level of sophistication will decide where the item will most likely be placed. A chair in a half is basically a long way to say it is oversized. 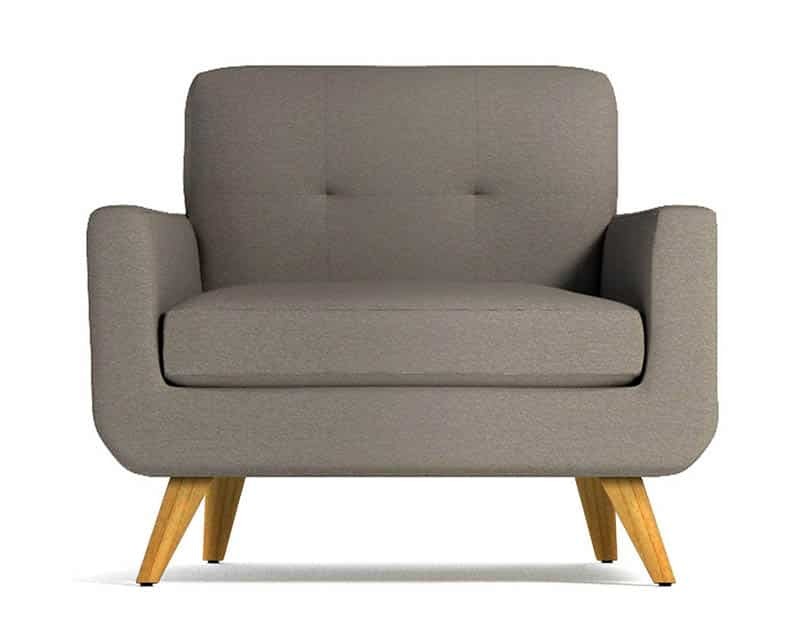 In size a chair and a half is between the size of a regular chair and a loveseat. This is used for relaxation due to the ability to spread out and get comfortable. These are offered in almost every style, color, and texture you could imagine. This is a good options because this makes anyone comfortable in the seating, even people that could possibly need bariatric seating. The chaise lounge is one of the most misunderstood seating options. The name comes from the French word for “long chair” which perfectly describes what it is. A chair that a person can put their feet onto will be classified as a chaise lounge. These chairs can have arms or can be one long seat. Though it is meant for lounging the lounge part of the word does not always mean that the chair is long. They are often available with either left arm or right arm support rests. The model shown above also comes with under seat storage for keeping extra blankets and pillows within easy reach. 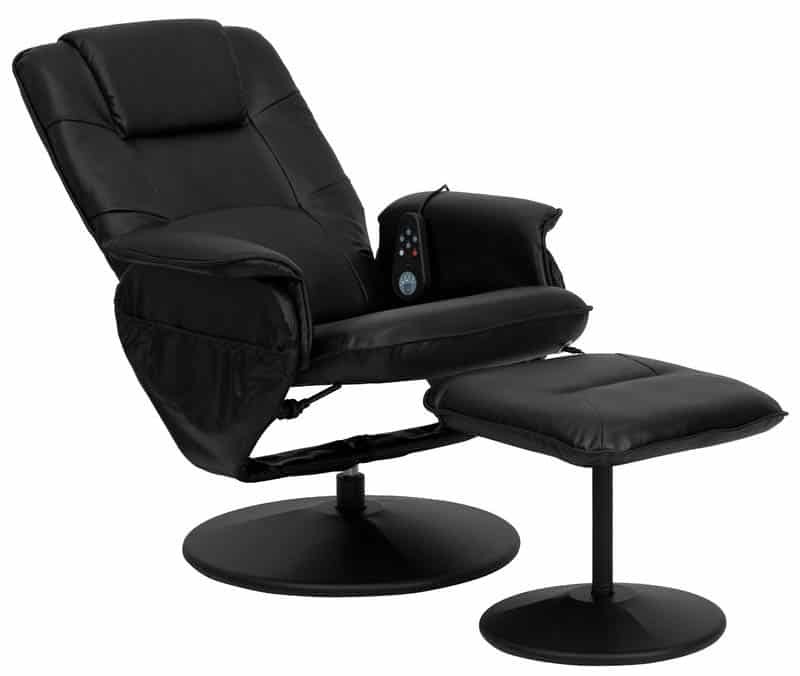 A stressless chair resembles a recliner with padded seat and back with headrest and ottoman. A lever conveniently placed under the arm rest brings the chair upright or to the reclining position. This type of chair is meant to provide the utmost comfort possible, to drain the stress from the body. They focus on support, comfort, and freedom to move as needed. The chair balances itself based on your movements to maintain optimum levels of comfort. This allows for the user of the chair to move freely without worrying about the chair tipping or moving. 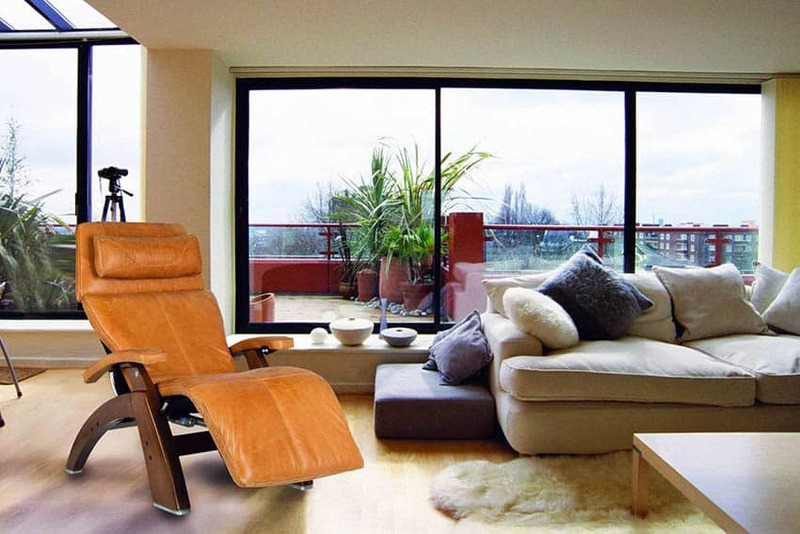 The stressless chair is commonly used in bedrooms due to the fact that once you get into the chair you will not want to get up and go too far to get to your bed. Finally a chair that’s name doesn’t make sense because it was designed in Germany! The chair was a collaboration between Mies Van Der Rohe and his partner Lilly Reich. This chair is one of the icons of modern furniture. 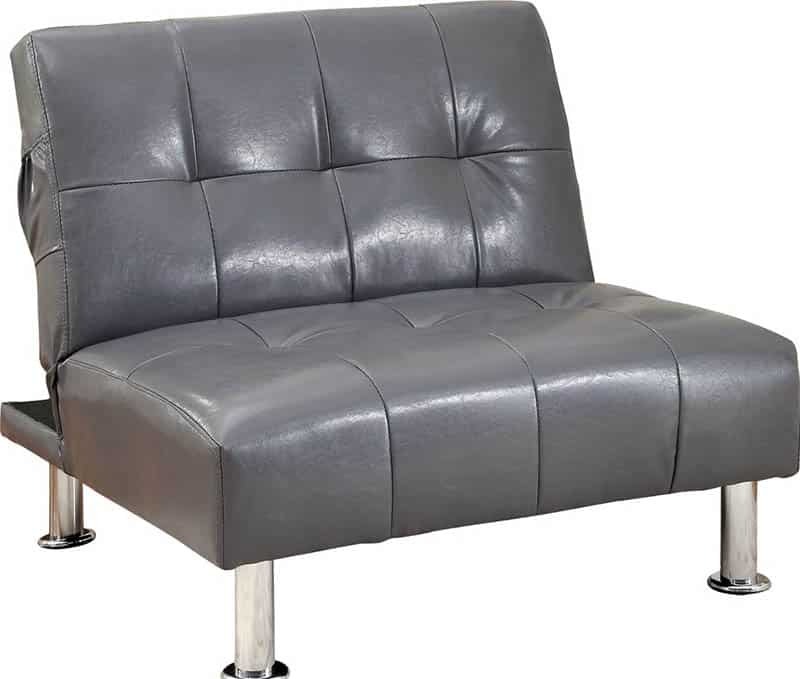 This design has a stainless steel frame that was topped by a cushion and bovine leather seat and back. 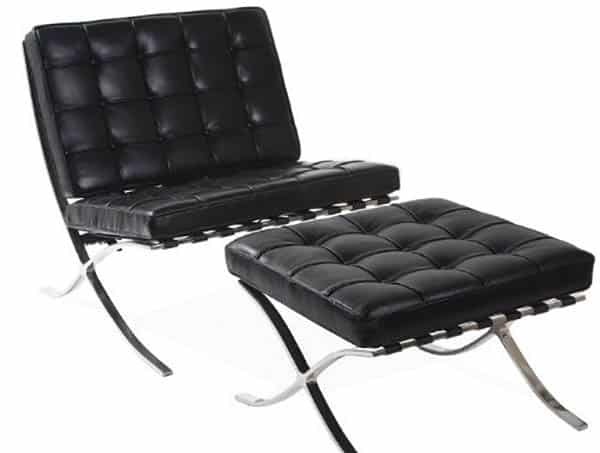 The Barcelona chair has been popular since the 1950s and is manufactured by Knoll. 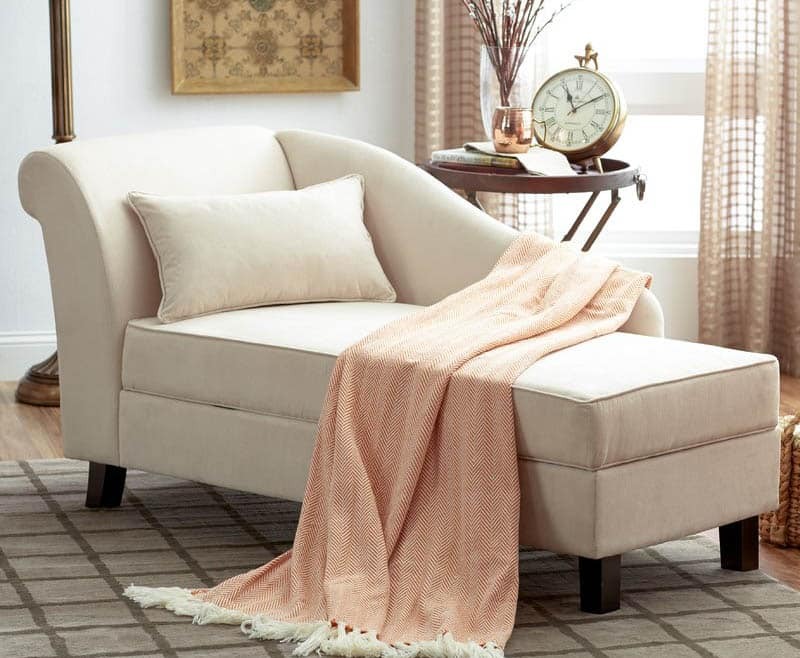 The Barcelona chair can also be used in the living room or as an accent piece in a bedroom. An ottoman is typically used as a footstool to be paired with a lounge chair. When guests are over and seating is limited though ottomans are sturdy enough to be used as seating as well. These versatile pieces can also be used for storage or as a coffee table! Some ottomans can come upholstered, while some are wood. Based on the design choices will decide which is best. In the bedroom this can commonly be used at the end of the bed or as end tables, all while giving a place to store things and also a small seat when putting on clothing. Any chair that is suspended from the ceiling is considered a hanging chair. 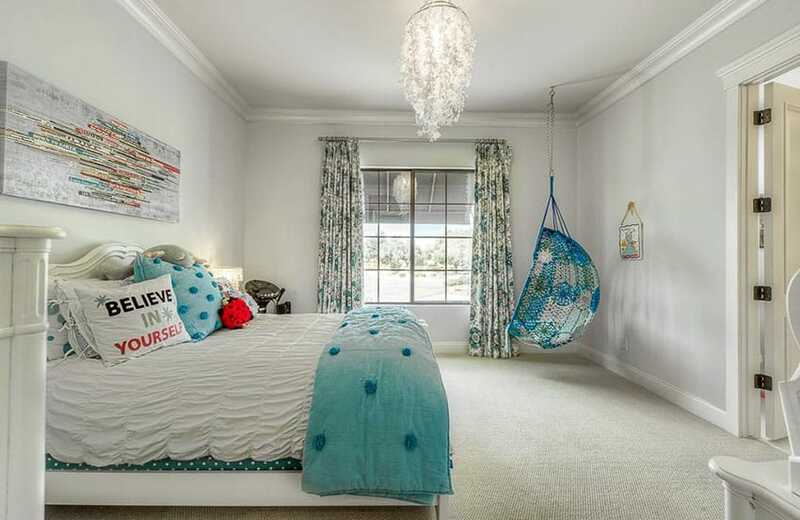 A good example is the typical hanging egg chair or hammock chairs. These will be typically made from wicker or some woven lightweight materials to offset the gravity of it being a chair that is hanging from the ceiling. These types of swinging chairs will need an extremely sturdy ceiling to hang from which is why they are typically installed outdoors. Some outdoor options could be swing chairs as well as hammock chairs as previously mentioned. There are also models that have a base on the ground with an arm overhead to support the chair. 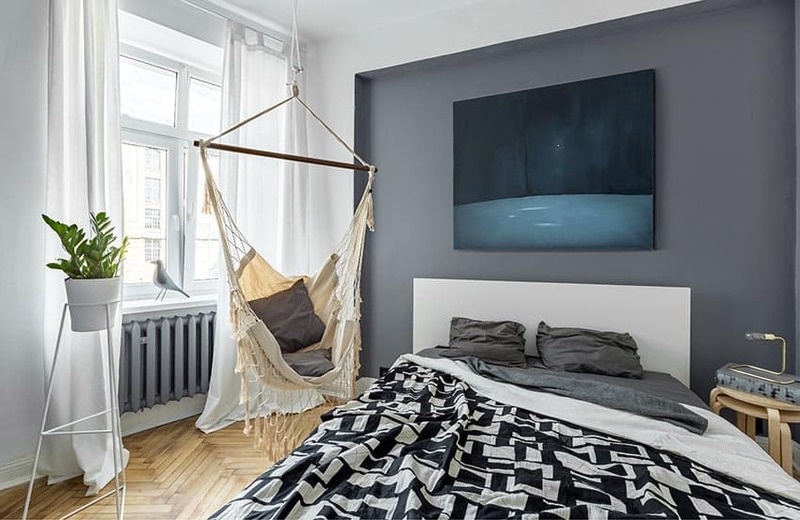 Hammock chairs, while invited into the bedroom for their lounge feel, are also sometimes used outside which is why they are typically made from extra water proofing materials as well as include special cushions. These chairs can be inexpensive when compared to other styles. As with the hanging chairs previously discussed these chairs will need a sturdy support system because of the weight of the chair and the person that will be occupying the chair, and even if a child were to sit there the gravity will still work its wonders and put pressure on the place that the chair is strung up. Makeup chairs can be used by professionals as well as amateurs. These chairs are often height adjustable. Knowing whether you are doing your own makeup or applying makeup for someone else will you help decide what size to get. 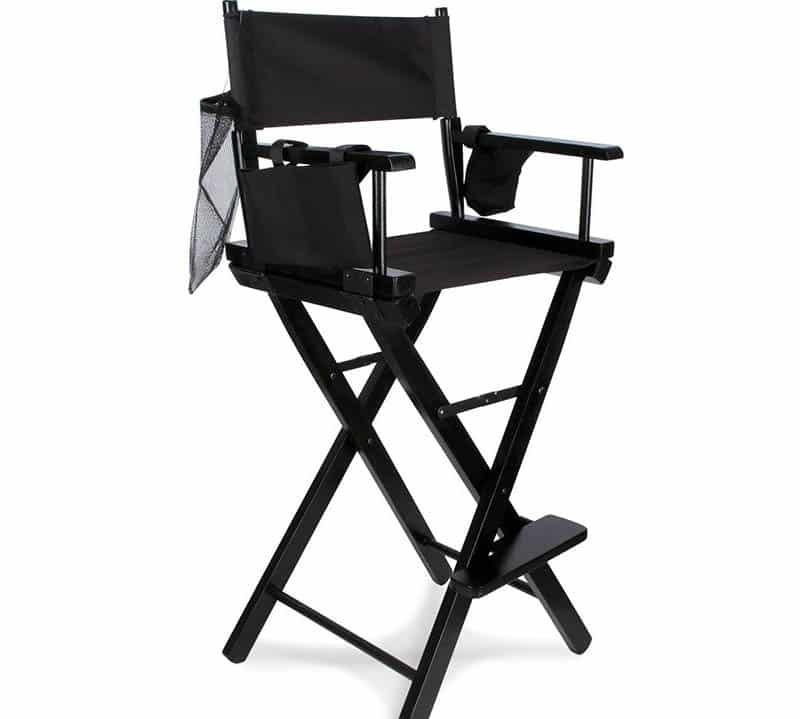 Makeup chairs are similar in appearance to directors chairs. They often come with storage pouches, water bottle holders or mesh bags for holding small items. These chairs are most typically made of a material that is easily cleanable due to the possibilities of spilling makeup products. A vanity chair is, as the name suggests, a chair that will be paired with a vanity. A vanity table will be used to apply makeup, and do ones hair. This chair will be similar to the makeup chair previously mentioned and will also often be made of an easily cleanable material. The chair will be either a stool or small chair to bring ones face and head to the correct height of the mirror and allow one to do their desired primping. 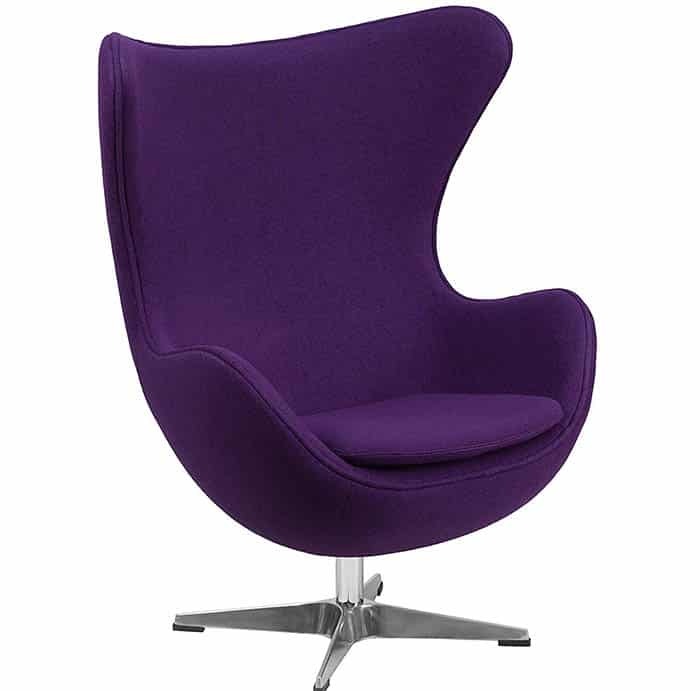 The egg chair was one of the most popular chairs designed in the 1950’s and 60’s. 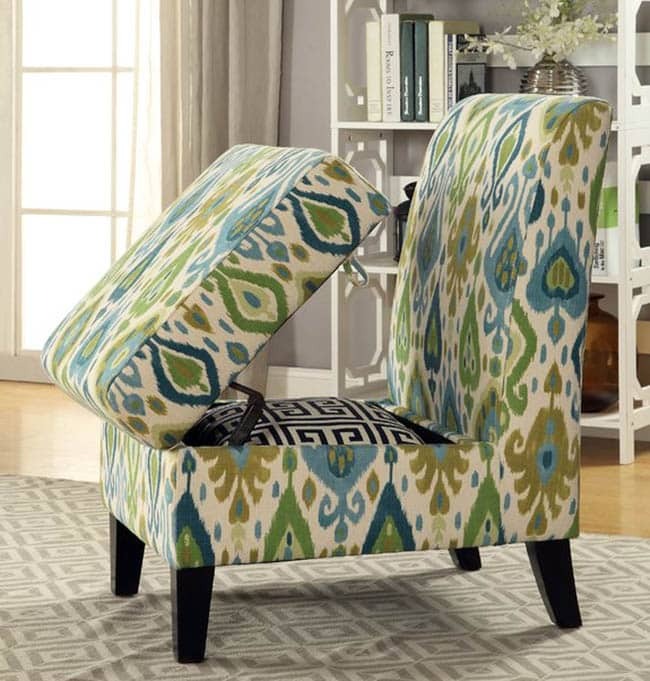 This chairs curves and upholstery still stays true and remains a popular chair. This chair was designed by Arne Jacobson with inspiration drawn from the womb chair for a hotel and from there it blew up and is still a popular staple in homes. This chair can also be made into a hanging chair which came as a later reinvention of the design. One of the main features of a dining room will be the chairs, because when you eat you will almost always want to sit! The dining table will typically allow for four to eight chairs and sometimes more depending on the size. A parsons chair contains clean lines and is extremely simple. This allows it to be used in a variety of different styles and settings. It is commonly an upholstered chair which can be anything from lines to leather. 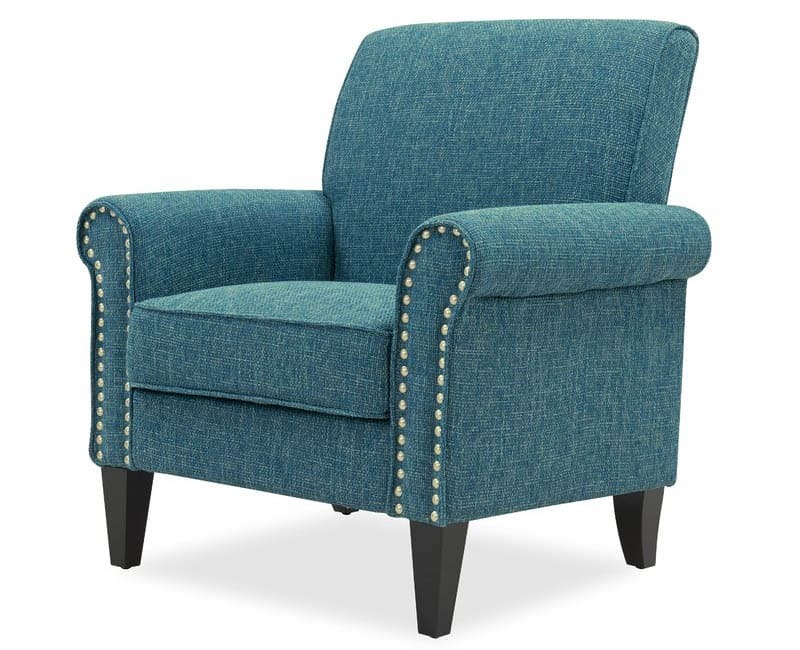 If the chair becomes too plain there is always the option to add tufting, patterns or buttons. 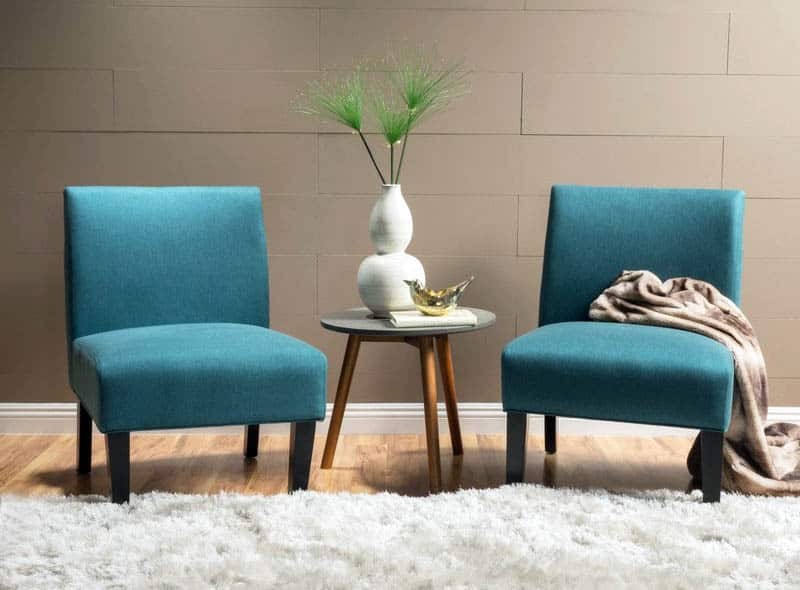 These options will raise the price of the chair but will make it unique to the certain space and home. The wishbone chair’s most distinguishing feature is the support on the middle back of the chair that splits like a wishbone, hence the name. Wishbone chairs will typically have a curved back to accommodate the split and add support. Most often these chairs will have a contemporary design look with neutral colors and will be small enough to be used as dining chairs. 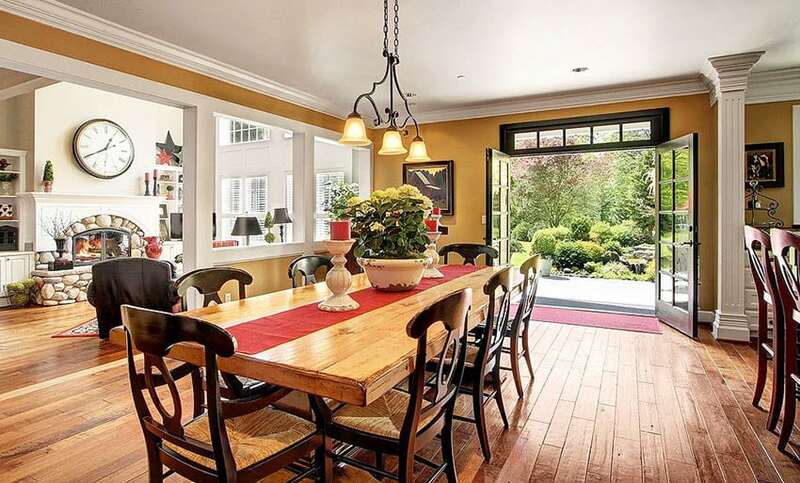 These chairs will often be a focal point and create a lot of attention to the dining room. The ghost chair was a quick staple, in only 10 years there were more than 1.5 million of the chairs sold. This is due to its sleek innovative design making a modern version of the plastic chair. 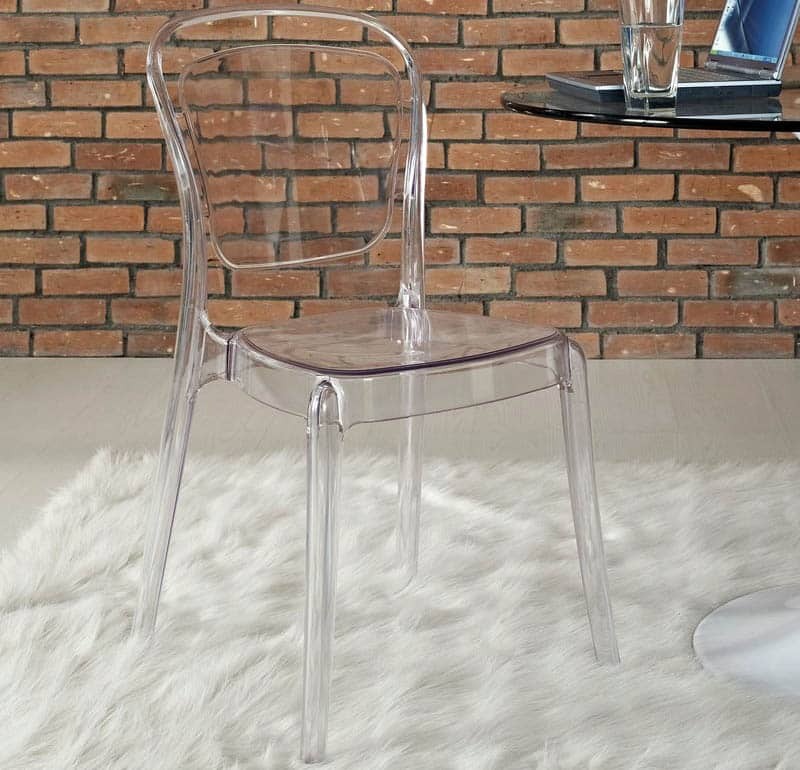 This chair is stackable and with its clear color lets the focal point of the room be something other than itself. The ghost chair’s see through color will make a room feel larger and more open. These chairs can take many different shapes within the style. They are frequently made of acrylic to provide their see through appearance. 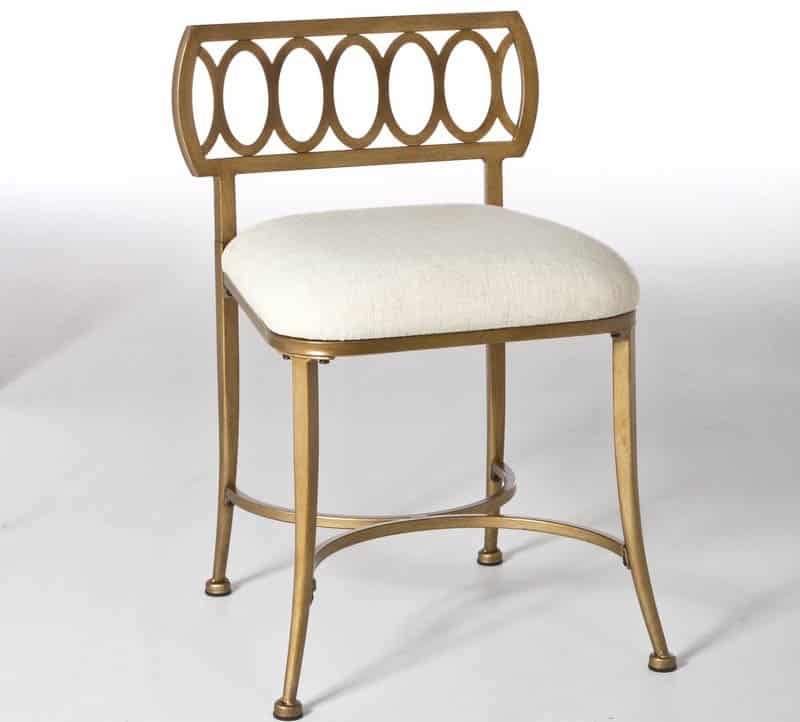 A side chair has a small solid frame that is often not upholstered. It can have arms and/or an upholstered seat but neither of those qualities are required. 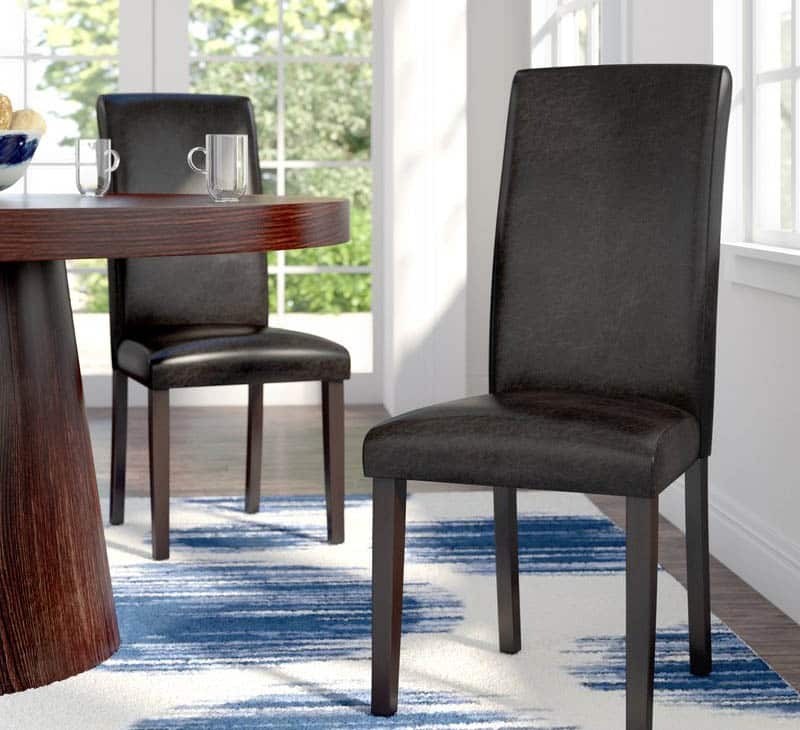 These chairs are typically used in dining rooms and can be added to living rooms as extra seating, due to this they are not very bulky for ease in mobility and storage. 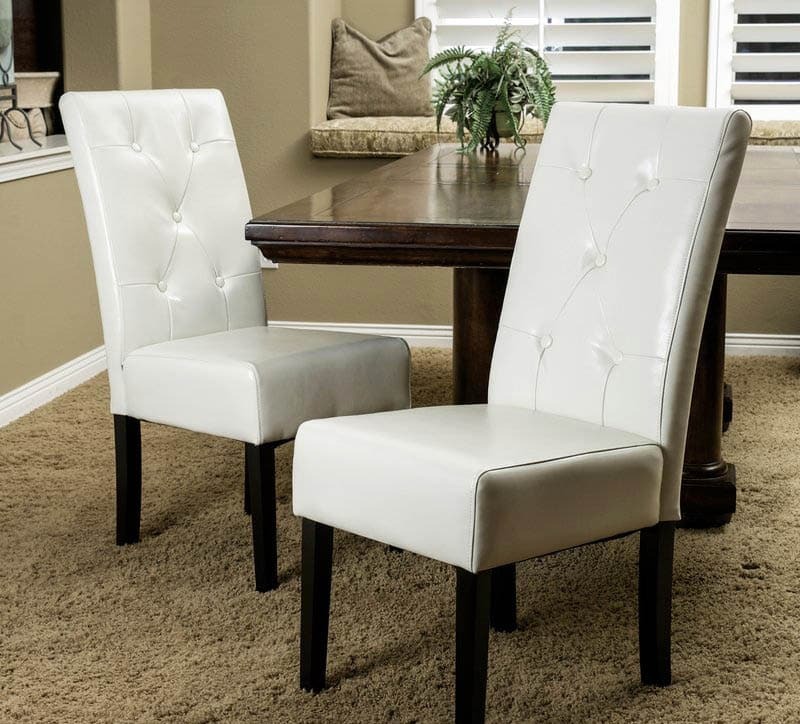 These types of dining chairs are often seen in a transitional design that is attached to a kitchen. They can also be used for additional seating on the fly while entertaining guests. The swivel chair was invented to do just that, swivel. From there the chair has expanded to have comfortable seats, armrests and a variety of features and colors. These chairs are typically used as desk chairs but also can be used outside. Bar stools come in many shapes and sizes, just like other chairs. These are commonly used under islands with long countertops or high top tables. 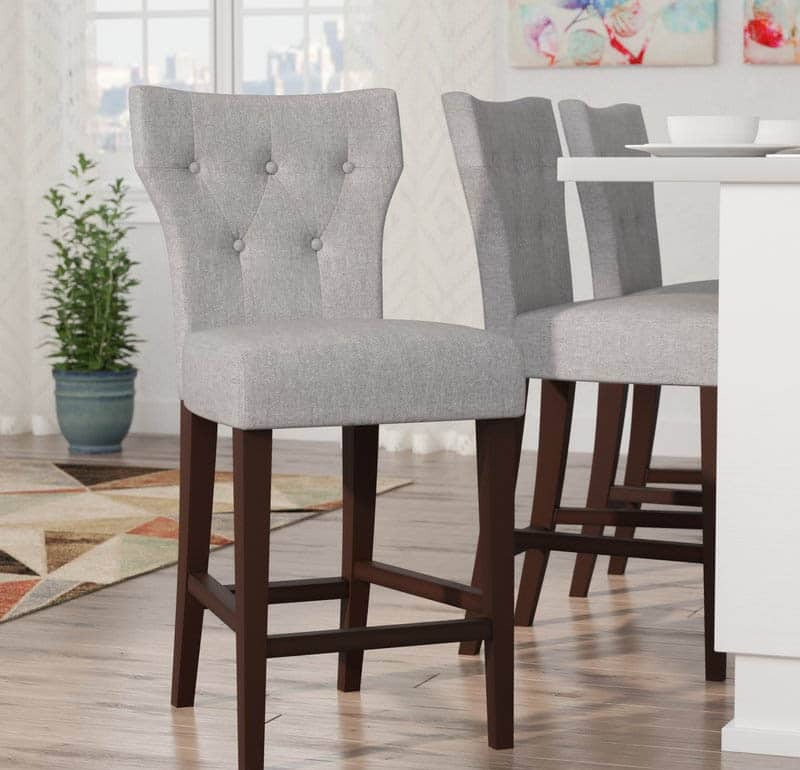 The key to getting a barstool that works for your home is measuring the counter or table first to know exactly what size you will need. Some will have adjustable heights but it is always better to be safe than sorry. Some barstools will have different features, like rotation, back, footrests, etc. Often barstools with backs are used when people are planning to sit in the stool for longer periods of time. In settings where the owner wishes the barstools to be a quick come and go spot they will often not provide a back to encourage the user of the stool to become uncomfortable and move to the next location. 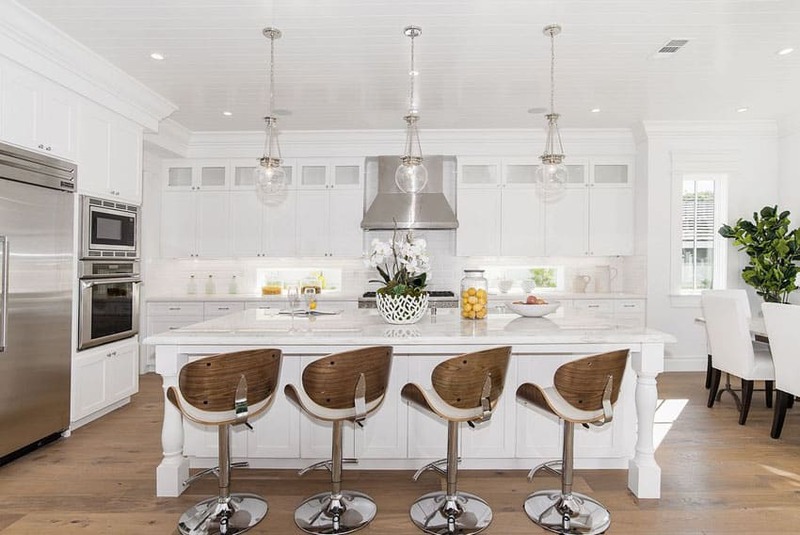 Also barstools with no backs are quite a bit less expensive than ones with backs, which can be a contributing factor to the design choice. While there are many different styles for upholstery to choose from, sometimes the functionality just is not correct for a certain situation. When making the decision to upholster or not think about the setting and the users of the chairs in question. Will spills be likely? Will anything stain or tear the fabric? Will the fabric become wrinkled if sat on for too long at once? For example, sometimes adding upholstery to a dining chair seat can be a dangerous move, not just for kids but adult too, eating gets messy and spills happen. Often slipcovers are available if the answers of those questions turn negatively and upholstery is still hoped for. 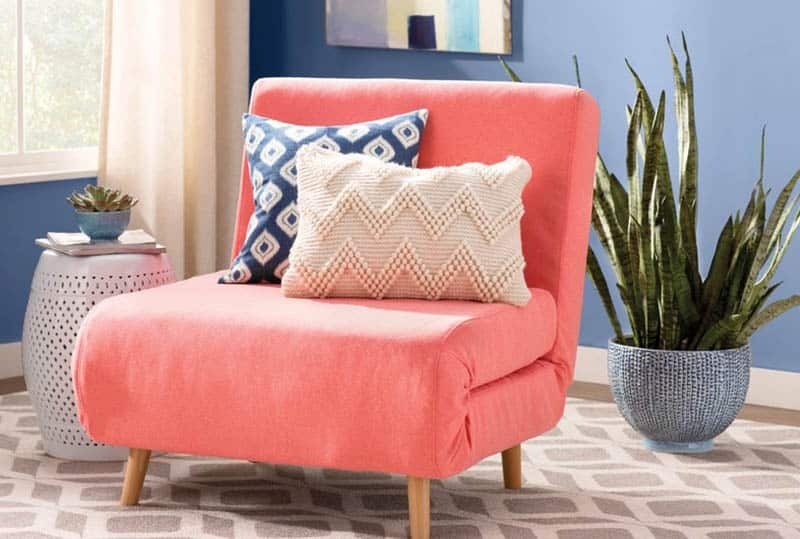 Another solution too could be to get a heavily patterned upholstery to take the pressure of spilling since the pattern will hide stains a bit better than say a plain white fabric. Even choosing something with better clean ability could be an option for a situation! 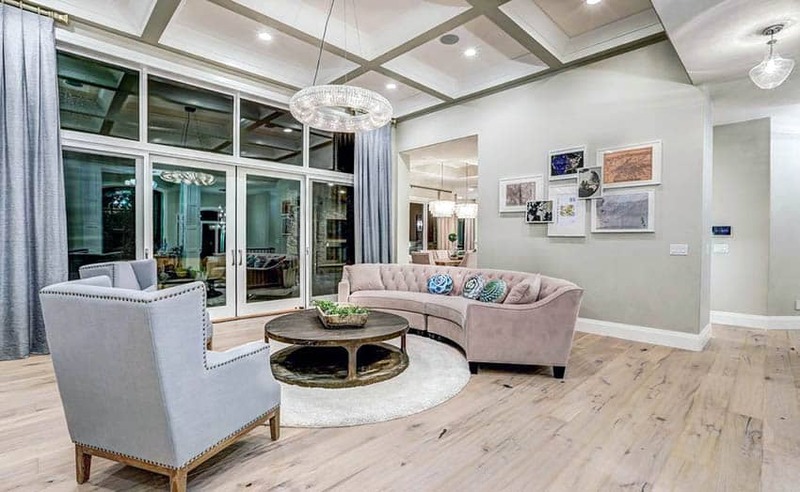 Leaving an item un-upholstered can add a great look to a space too, whether the chair is wood or metal, the natural elements are beautiful in their own and do not always need to be covered. 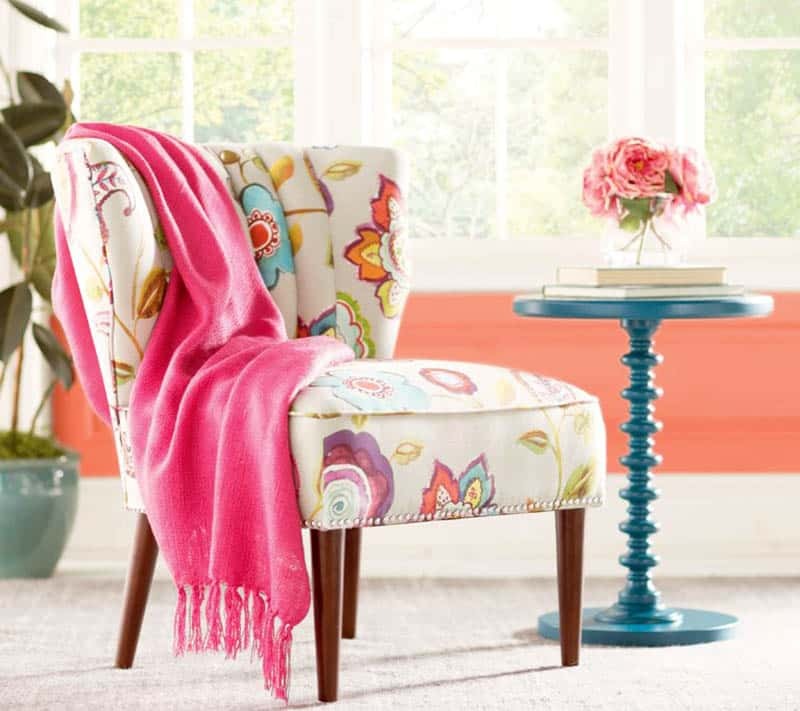 Leaving a chair not upholstered not only takes the staining risk down massive amounts, but it also will usually lower the price and delete a bunch of decisions that would need to be made about fabrics and cushioning. The traditional, old school dining chairs include heavy ornamentation. This style chair will have elaborate rails in the back, often going vertical with a design in the middle. The legs of the chair are often curved and carvings will be found all over the wood. Traditional style chairs include chairs from the Queen Anne, regency and Chippendale eras, as well as some other traditional styles throughout time. Traditional chairs can have upholstered seats as well as wooden. The modern chairs will directly contrast the previously mentioned traditional chairs in the sense that they will be extremely organic and not contain much unneeded ornamentation. These chairs are often made out of molded plastic or metal. These tend to be plain in color and not contain any patterns or upholstery. 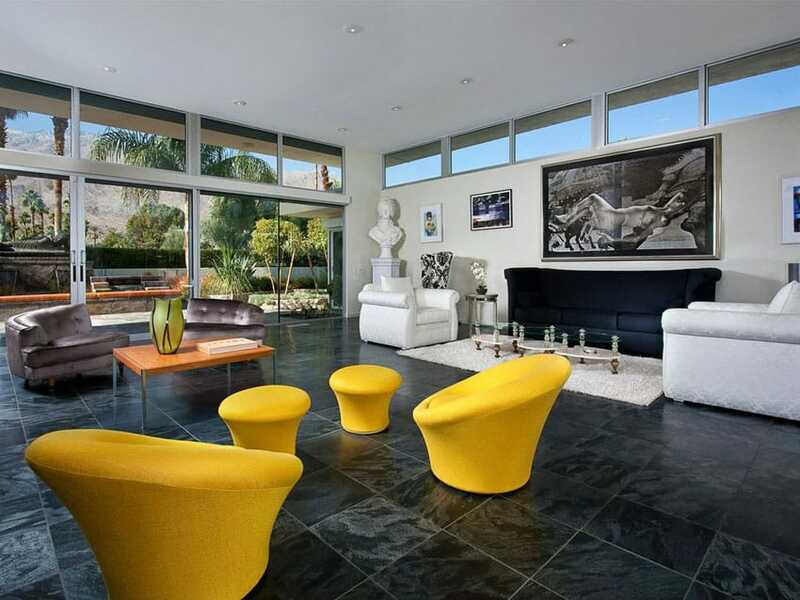 Currently contemporary chairs are very similar to the modern style. This will mean that the chairs in the contemporary style will often be made of bent woods, metals and plastic. These pieces will most often be left as natural and organic as possible. These will also lack ornamentation and patterns. The ladderback style chairs will have wooden backs with rails on the back that will determine the height of the back of the chair. This is how they are commonly referred to depending on the number of rails, such as “four-back” chairs. This type of dining chair got popular due to its simplicity and versatility. The rest of the chair is typically straight lines and can contain a cushioned and upholstered seat or remain wooden. The mission is commonly lumped in with the shaker style chairs. This type tends to be extremely clean cut with no extras or additions. Vertical and horizontal lines are a big staple for the style. Some, but only some, shaker styles will have a curved back, but other than that everything is straight and to the point. These also can have either a natural wooden seat or an cushioned and upholstered seat. The Windsor style chair is often considered a classic style. The features of this chair are the spindle back and legs. The back of the chair will have many vertical pieces that will be either bowed or hooped. This often gives a country, rustic feeling. Being completely made of wood this is typically used as a casual chair. Careful using this chair with small children though because the vertical back pieces are begging to catch a small arm or leg! Having a comfortable office chair is important to maintain correct posture and avoid back pain. Long hours at the computer can put long term strain on the spine. 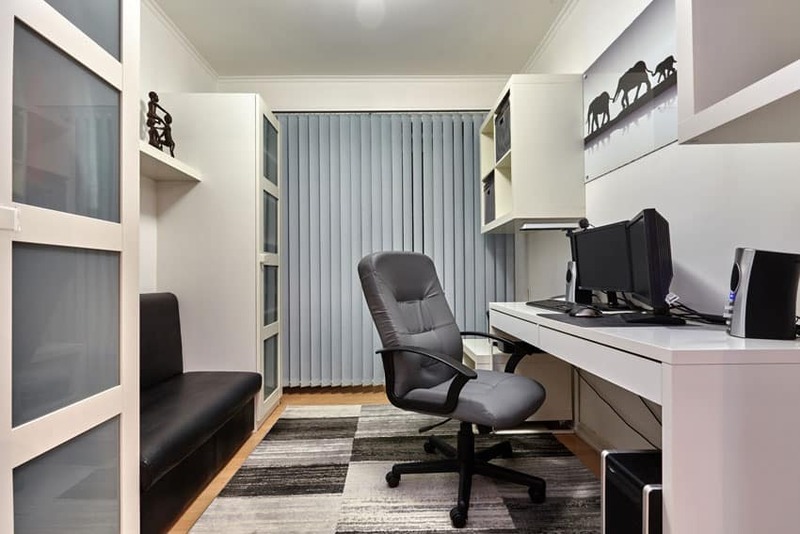 Below are popular office chair designs to help you decide on the right one for you. Desk chairs are extremely important because some office workers spend 40 hours a week or more sitting in them! 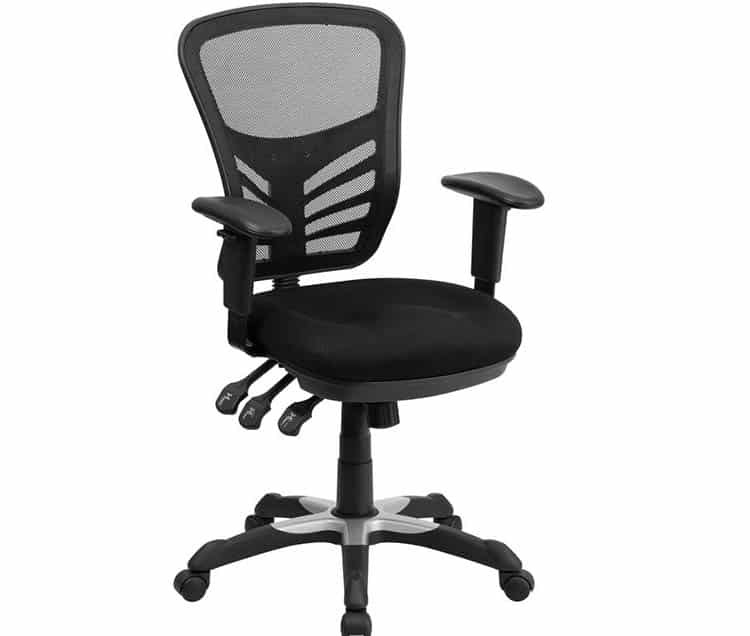 Desk chairs can have plenty of features that will make them easier to adapt to users. Often users don’t realize that their chairs have different settings. Usually you can change the height of the seat and arms as well as how far back you can make the hair lean back. Getting the right fit or switching to an ergonomic chair will make a huge difference. Ergonomics is the design related to the working environment and the comfort and productivity in it. Some alternatives that have better ergonomics in place of traditional office chairs can be the stability ball, sit to stand chairs or even stools. Stability balls not only force you to sit up straight but they also activate your muscles while you are working to keep you more alert and comfortable. Sit to stand chairs and stools are another great alternative because they offer the ability to change your position and also force you to sit up straighter. 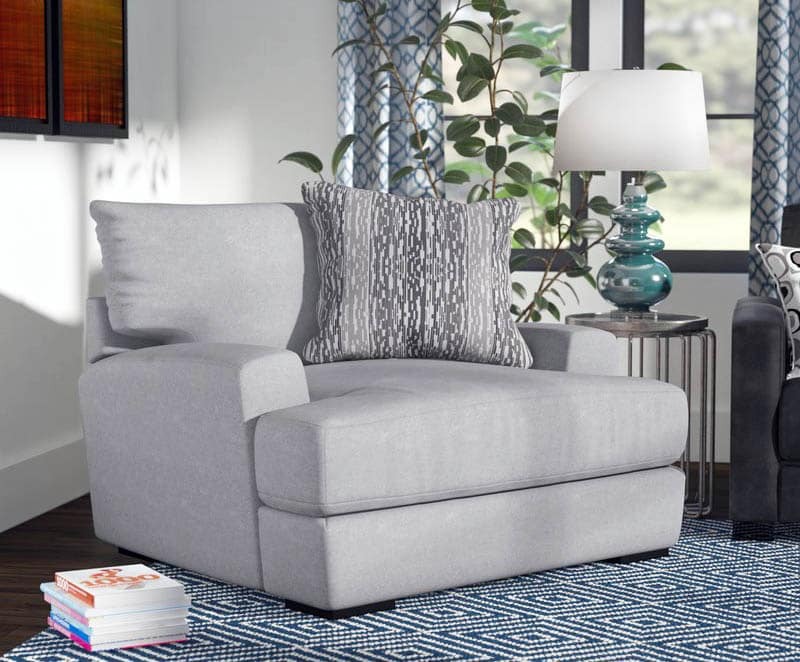 While a reading chairs can be anything from a chair with an ottoman to a recliner the most important factor is comfort. When snuggling up with a good book you will want your feet up and if it’s a good book you could be there for hours so you will definitely want some space to adjust positions. 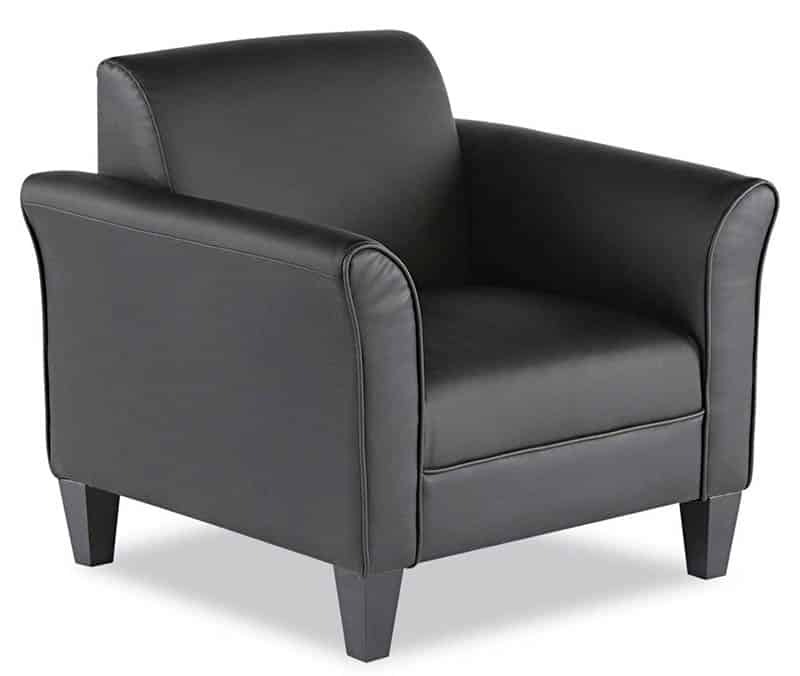 Some reading chairs that can be placed into studies will be large wingback chairs made of leather to show power and authority. Some though could be places in bedrooms and use more of a stressless design to relax the user after a long day. Gaming Chair- Gaming chairs are chairs with features that you will use when playing entertainment games. These chairs can include Bluetooth speakers and often sit on the floor to position you properly in front of the console. Some desk chairs also include these gaming features! The floor version is typically a crescent shape that sits directly on the floor. This shape allows for rocking motions as well as mobility to move forward when intense parts of games are going on or lean back for the casual parts. These chairs can also be used for viewing television or movies to have a good close sound system. 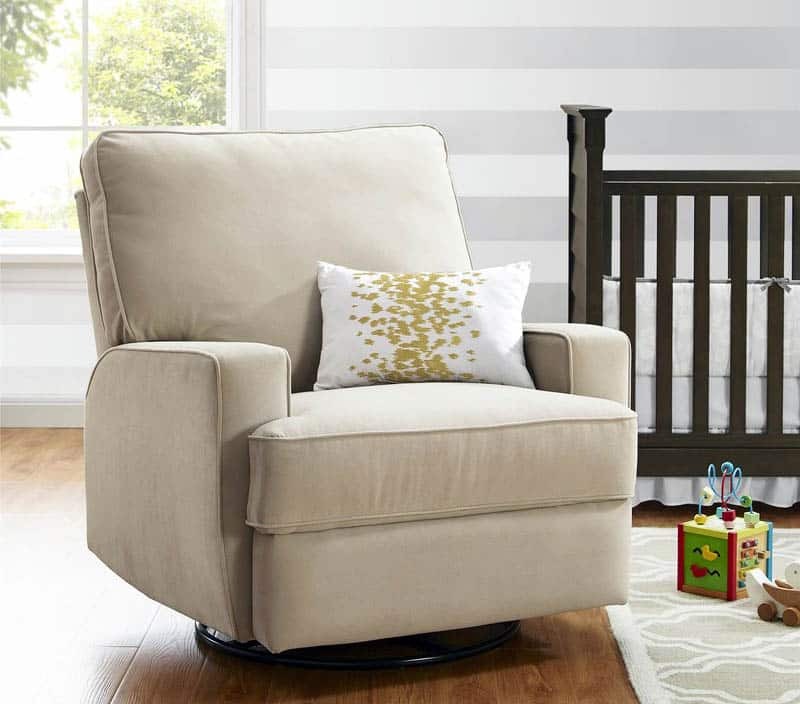 A comfortable chair for a newborn babies room is important for nursing mother’s and rocking a baby to sleep. As a child grows a chair in their bedroom is useful for reading books to them at night. When they are older they will have a comfortable place to sit while playing with toys or reading themselves. With the addition of a table or desk a child can do arts and crafts, or homework from their room. Here are an assortment of kids chair ideas to help you find the one that suits your needs. A glider chair is commonly used in place of a rocking chair to give a more back and forth motion versus the rocking. This keeps the baby moving while still being able to feed them. Often glider chairs will include ottomans that also glide with the chair. Soothing to anyone who enjoys a rocking sensation, rocking chairs are an American staple. Though it is a very American thing, the rocking chair was actually designed in Europe. 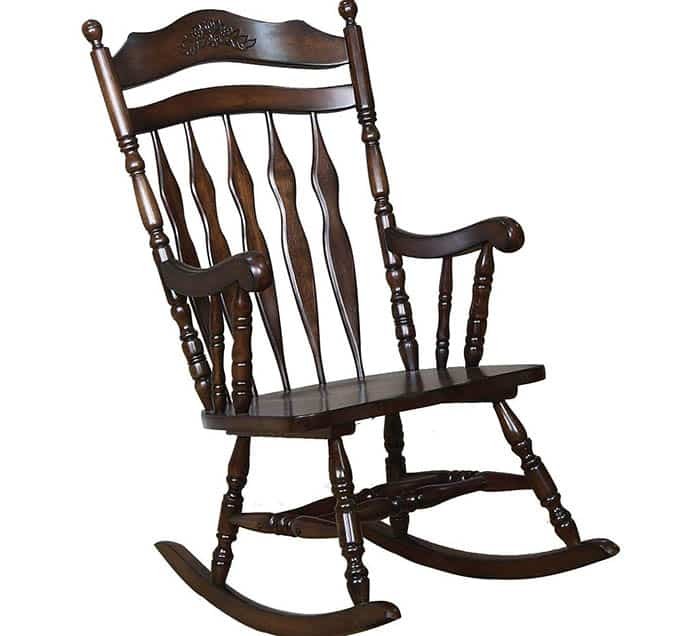 Rocking chairs, often called rockers, are almost always wooden, sometimes having arms and is mounted on curved rockers. Nowadays there are many looks that the chairs have, metal, upholstered, etc. There is even a type that avoid pinching that sits on a stables base while the suspended part of the chair rocks. The bean bag chairs is basically as the name suggests a bag of beans! These can be any made in any sizes and the shapes change when you sit in the. Bean bags will get more squished over time which may require replacing the beans inside (the bag part usually will have a zipper to take out or put in beans). This is an extremely comfortable seating option due to it conforming to the body of the user. Unfortunately it can be harder for older people to get in and out of the chair. 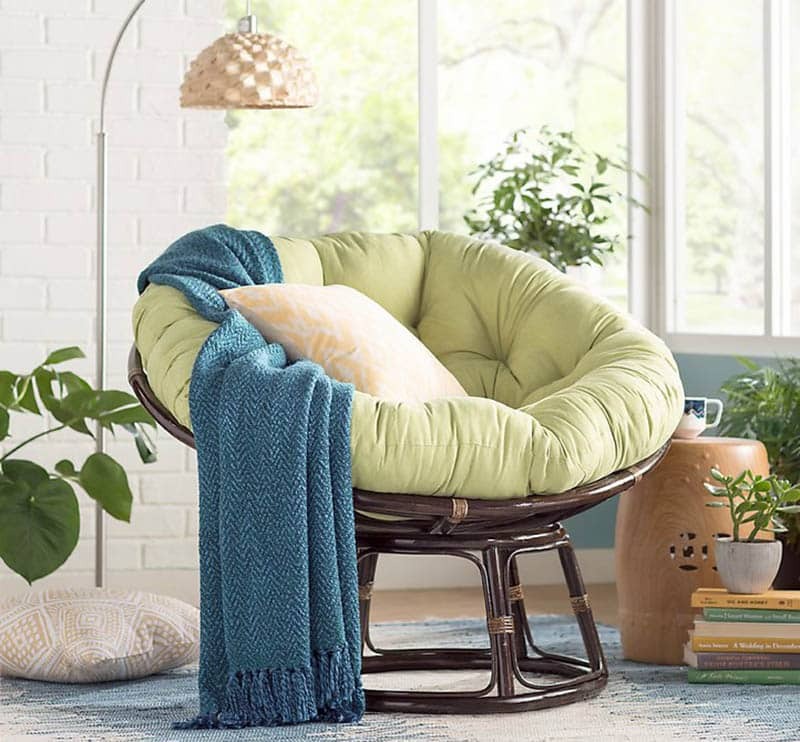 The Papasan chair is also referred to as the bowl chair or the mamasan. Similar to the nickname of the bowl chair this is a large rounded, bowl shaped, chair with a slight angle. The base is made from either wood, metal, or wicker while the cushion is made from thick cotton or velveteen. There is also an option that the frame can be folded for easy storage and those are often referred to as “moon chairs”. These types are fun for curling up and reading your favorite book. Now that the type of chair has been selected, the materials are the next most important decision. Based on the location and type you have selected will greatly impact which materials you should use. Polyester – Polyester is a good material for durability. This fabric is tested strong against the climate and will still look like it is in tip-top shape. When it comes to any outdoor furniture such as hammock chairs or anything wicker, polyester is the way to go! Leather – Leather tends to be a prestigious material, often given to offices that hold executive and people in power. This is because leather tends to run more expensive that other materials, so it is saved for the higher up employees or people with more money to place leather things in their homes. Leather is also susceptible to sun damage so it is important to take care of the material. Cotton Fabric – Pros of cotton fabric will be the way it feels on the skin, the durability and the vast amount of color options available. Unfortunately this product is susceptible to sun damage and also is flammable if not treated. Wood – Wood is a lot of peoples go to material and while it is an amazing material it is not for everything. It is a sturdy material that comes in many styles and a set of colors and stains. Unfortunately wood can be susceptible to sun damage as well as stains. These will need to be fixed with special cleaners. Wicker – Wicker is a technique that is used to make woven products. Tis will be used a lot in outdoor furniture and when looking for something to be lightweight and weatherproof. Plastic – Plastic is a very cost efficient product and can be used indoors, outdoors, and even with children. Plastic chairs are extremely easy to clean and maintain. Unfortunately there tend to be a lot less comfortable than the other materials that you can choose from. It is also important to know the durability of the piece that you pick out because some plastic chairs are extremely flimsy. 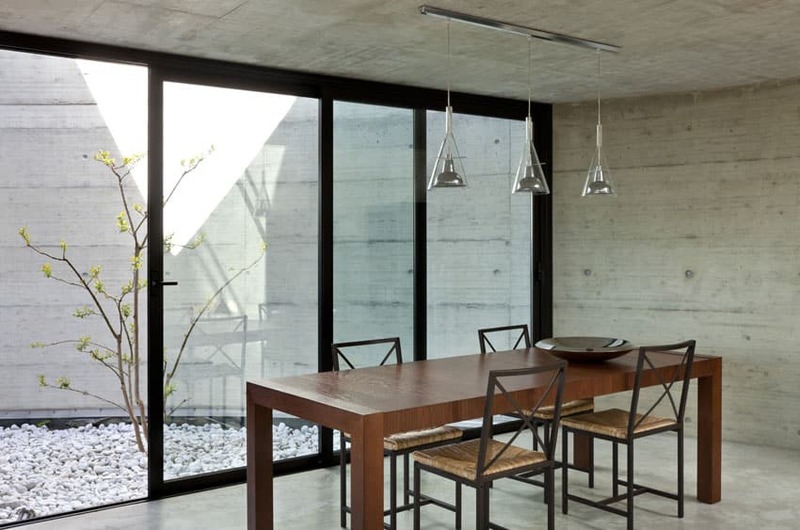 Metal – Metal is often used on stools or dining chairs. Luckily these will be a bit cheaper than solid wood pieces. Metal will also be able to be shaped and color is a wide variety of different shapes and colors and still look phenomenal. Unique chair designs are available for many purposes. Those who want to make a statement can find models with bold prints and patterns as well as oversized furniture to give your space added character. 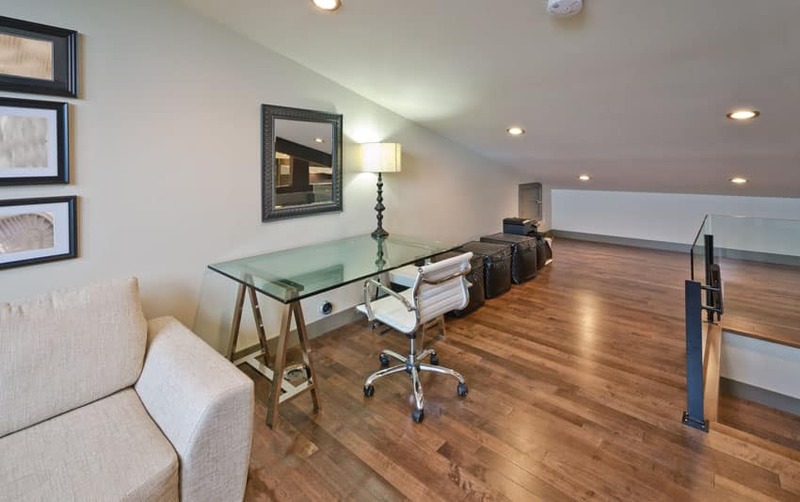 There are also chairs that serve multiple purposes, such as underneath storage or becoming a fold out bed for guests. There are even chairs designed specifically for health benefits such as increasing circulation. below we explore some of the interesting and unique chair designs on the market. Chairs and ottomans sometimes contain storage spots inside of them. This is convenient to store things like blankets, books or even the remotes. Ottomans commonly open allowing for the storage of items. Recliners or some chairs offer the arms to open up as a handy place for the remotes, and some even will have cup holders or charging stations! The zero gravity chair is designed to put your body in the position to feel stress free, energized and weightless. This will elevate your feet higher than your heart which will change the blood flow and minimize the impact gravity has on your body daily. A sleeper chair is comparable in size to a chair and a half that can be turned into a bed when needed. These are typically folded out when needed as a guest bed and are designed similar to a folded futon mattress. They are primarily the same as a convertible chair in design. Convertible chairs are able to be converted into a bed. 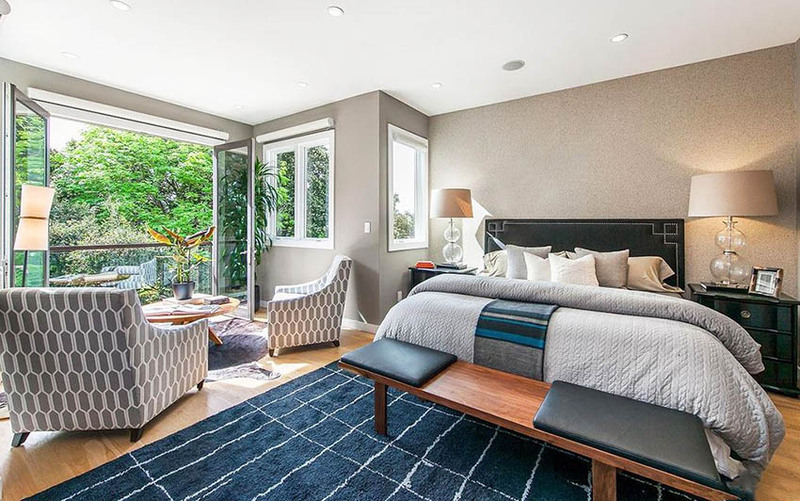 This is really great when there are guests staying over.The design shown above requires two chairs to be folded down and pushed together to create one bed. These pieces have changed a lot since the days of fold up futons and now are a lot more comfortable as not only couches but also beds. You can read more here about popular types of beds currently available.